Area Moment of Inertia Calculation | Stress Ebook LLC. Area Moment of Inertia Calculation – CAD (FEM is similar) method Vs Classical Hand Calculations method. In this post we will dig into a few things, one of the most common values (area moment of inertia ‘I’) used in a number of margin of safety calculations, principal area moment of inertia calculation, the orientation of the principal axes, and an example case with pure unsymmetric bending. Moments of inertia are a measure of the mass distribution of a body about a set of axes. Think of a rotating ice skater. If the person stretches the arms out, she slows down and speeds up otherwise. Hence the smaller the inertia the more concentrated or closer the mass is about a particular axis. Want to get instant updates on the latest posts like this one and a free Ebook? Nowadays, it is convenient to simply use either a CAD program like Solid Works, or an FEM pre-processor such as FEMAP to get all the data you need for a given section cut. But do you really understand what data it gives you? We can get the section properties of a given cross section by simply clicking some buttons. 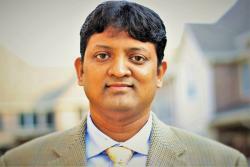 However, every now and then, it is a good idea to revisit or jog your memory back to the classical method of area moment of inertia calculation, and the section center of gravity calculations. 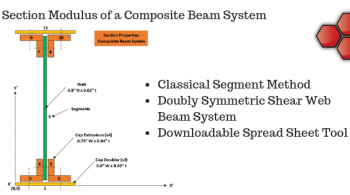 But, first let us look at the Solid Works method of getting these section properties. The following figure illustrates a sample L-Angle cross section highlighted in cyan color. The properties of the section are what we are interested in. The part origin is at the bottom left corner of the selected section. We can also see a custom coordinate system "Custom CSYS" for reference purposes. It is logical to guess that the centroid of this surface will not be on the surface itself but somewhere in the top right of the angle. In the 'Evaluate' tab in Solid Works there is an icon to calculate the section properties as shown below. After selecting the surface of the section, click the icon circled above. This will bring up a pop up dialog box that will list the section properties as shown in the figure below. So starting from the top in the figure above, we can see the total surface area is 40 in^2. 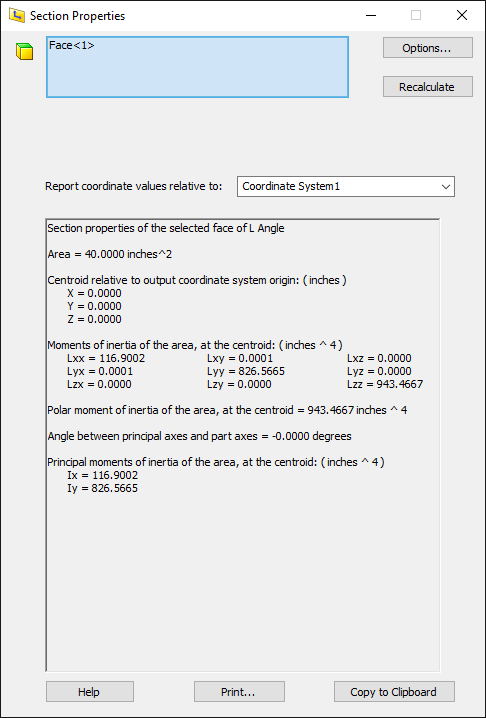 The centroid is at X=5.2 in and Y=2.2 in, as expected, w.r.t the origin of the selected coordinate system in the pull down menu (--default--). 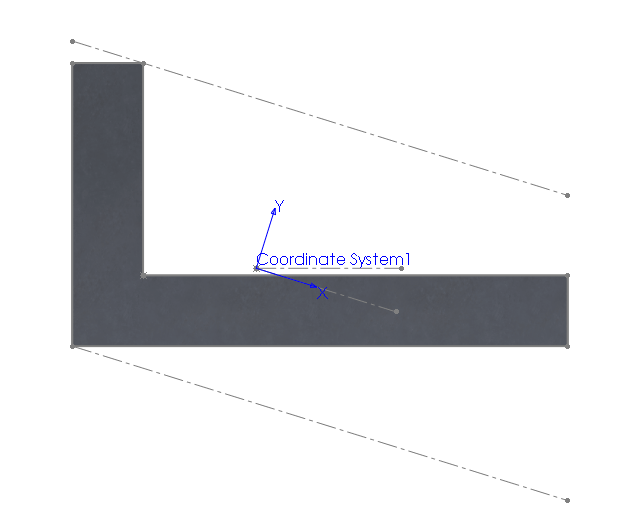 The origin of the --default-- coordinate system for this part is at the bottom left corner of the selected section. The following figure illustrates how Solid Works displays the area moment of inertia calculation results on the section. Next one down in Figure 3 above is the moments of inertia matrix reported at the centroid. This includes the planar bending and torsional values along the diagonal of the matrix, and the products of inertia in the selected coordinate system. We can see that the products of inertia that involve the 'z' axis are zero. The reason for this is that the xy plane of this section is the only plane of symmetry. 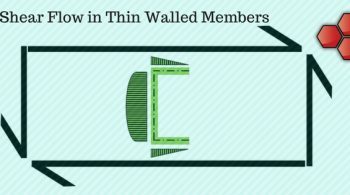 In other words, on each side of the section along 'z' the shape and size of the material is the same. Hence all products of inertia about 'z' are zero. All the values in the matrix are reported in the selected coordinate system (--default-- or part coordinate system in Figure 3). 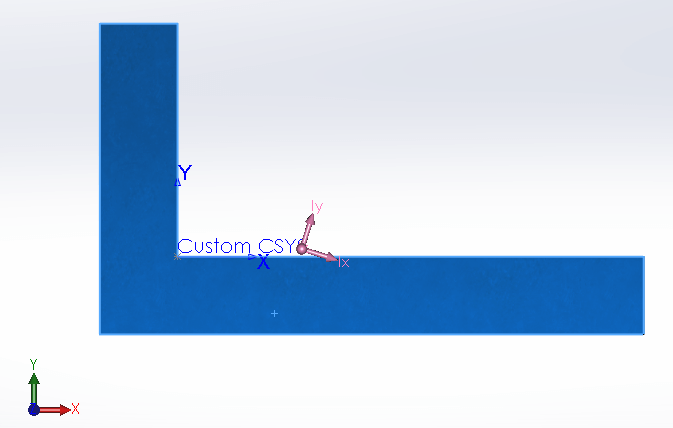 But you could select any other coordinate system, for example the "Custom CSYS". Next down in Figure 3 above, we can see the polar moment of inertia Lzz about 'z'. Next we can see how the principal area moments of inertia axes are displayed using a pink coordinate system at the centroid. The angle between the selected CSYS and this principal CSYS is -17.3108 Degrees (clockwise is negative) as shown in the Figure 3 above. This is the coordinate system about which all products of inertia Ixy, Iyz and Ixz are zero. The principal moments of inertia are always reported at the centroid about the principal axes. There is a different set of inertia matrix for each CSYS passing through a given point. There will be one set of axes about which all products of inertia are zero at any given point on the section. But In general the principal axes are different for each point on a section. 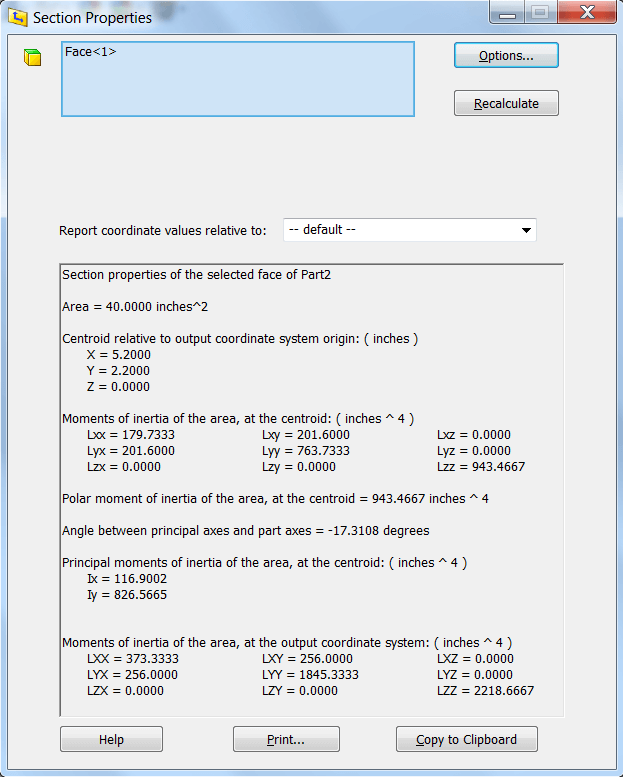 Finally, at the bottom of Figure 3 above, since the selected coordinate system (default) origin does not coincide with the section centroid, another 'moments of inertia matrix' is displayed, which accounts for the parallel axis theorem w.r.t the selected output coordinate system (default). 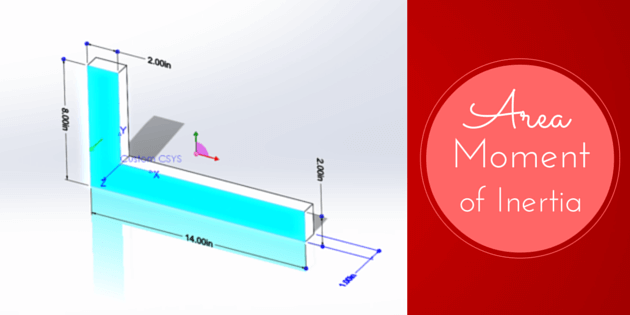 Using the new CSYS1, we will again use Solid Works to calculate the section's area moments of inertia. So clearly, all the products of inertia are now zero about the principal axes. The centroid in the custom CSYS1 is at (0,0,0) which is its own origin. It is noteworthy that in section checks, the section loads and moments are evaluated and extracted from the finite element model at the CG. 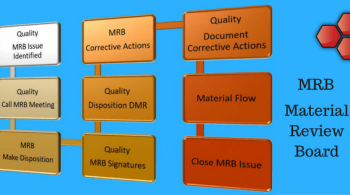 They are then used in combined stress margin of safety (MS) calculations using these section properties. 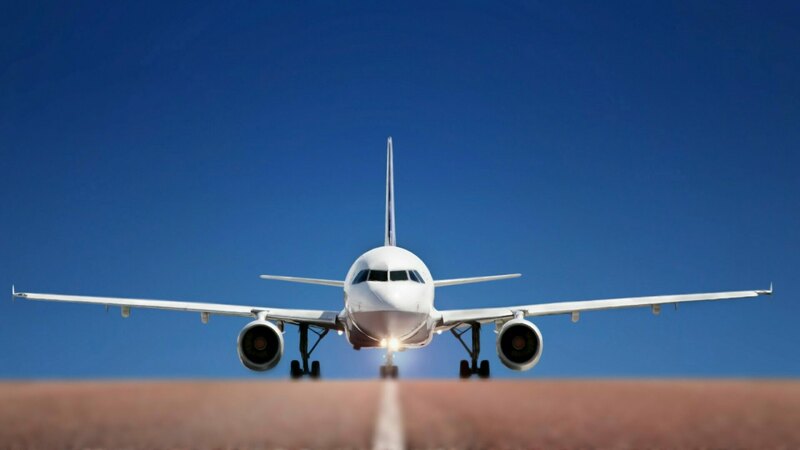 Finite Element Analysis CourseBronze Level Course! 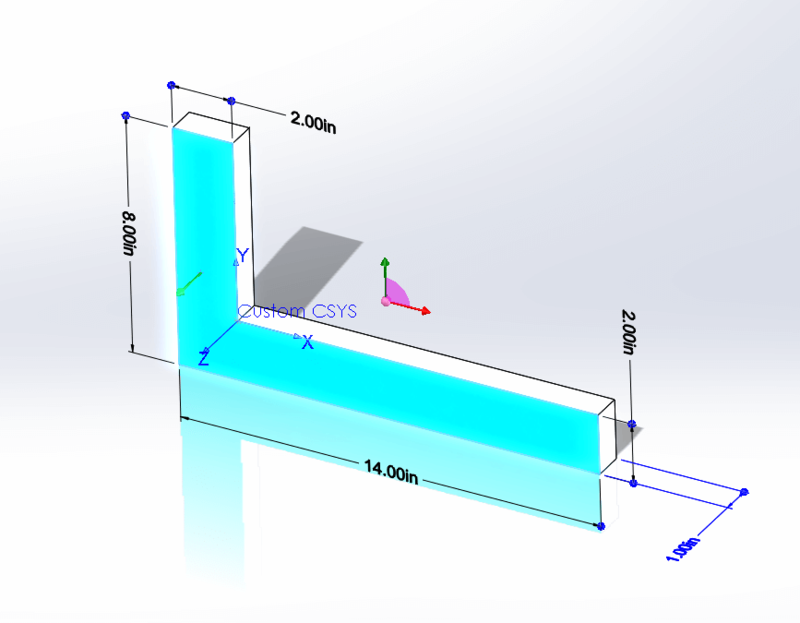 OK so far we have learnt how to measure a given section's properties in a CAD program such as Solid Works (others will be similar, including FEM programs). Now let us dig into a different method using an example problem. The same angle section discussed above is used in the example below (click the link below for more details). The paper works out the moments of inertia and stresses using Classical Hand Calculations for a case of unsymmetric pure bending.